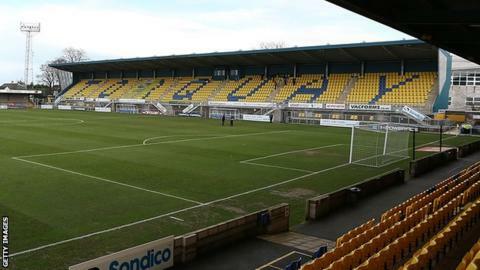 National League South side Truro City are to share Torquay's Plainmoor ground for part of next season, which means a 172-mile round trip for home games. Truro have suffered delays in the planning process for a new ground on the outskirts of the city. They had hoped to move at the start of next season after selling their Treyew Road ground to developers. "We will be groundsharing next season. It may only be for a few months," said Truro City chairman Peter Masters. "I've been up to Torquay twice this week to sort it out, they've been very helpful towards us," he told BBC Radio Cornwall. A move to cash-strapped Torquay by Truro was first mooted in May and any income will be welcome at Plainmoor. The Gulls are in the bottom three of the National League after having budgets drastically cut in the summer, when millionaire owner Thea Bristow left the club and a new board of local businessmen took over. "The important thing is we'll have somewhere to play next season and to go forward, and that's all I'm interested in," added Masters, whose side drew 2-2 with Cirencester in the FA Trophy on Saturday. "The league knows the whole position. I've now got to have a meeting with the league to finalise the points on it all, but we are allowed to groundshare under certain circumstances. "It's a case of putting that business case to the league and get them to rubber stamp it. "The planning procedures to go through are notorious for delaying things - had things gone as we thought we would have had a spade in the ground in January." Truro's impending move follows League Two side Carlisle United having to play their next two home games at Preston and Blackburn - round trips of 114 and 198 miles - respectively as Brunton Park recovers from flood damage following Storm Desmond.